Sherburne Hospital was founded in 1181, originally as a leprosy hospital. As the centuries passed, this disease became less prevalent and the hospital provided a home for the poor and chronically ill. 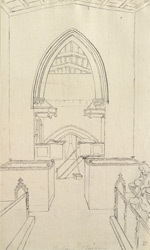 When Grimm made this sketch much of the original 12th-century chapel would have still been standing. Less than 50 years later, a fire lit in the chapel to warm the building for service the following day spread out of control because of a blocked heating flue. The wooden panelling soon became ablaze and the chapel was gutted. Five years later the interior was completely renovated.